As well as Natural Ventilation Exhaust turrets we are able to offer a complete range of wind powered terminals. 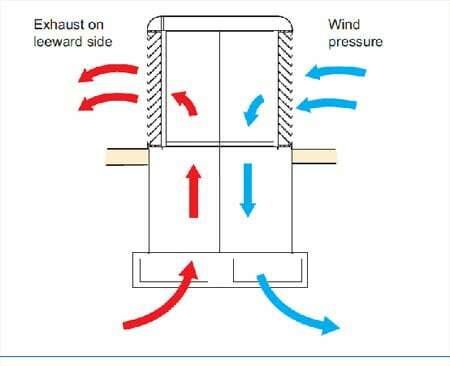 A wind powered system operates somewhat differently than a stack effect system relying more on the wind driving cool fresh air down into the building with the warmer air exhausting both through buoyancy and incoming air pressure displacement. In order to create this feature the turret is fitted with specialised splitters that provide four separate air paths. Air is driven down into the occupied zone through one or more of the airways and is then exhausted through the remaining airways. The wind direction will determine which airways are used at any particular time. The turret is fitted to the roof using our standard installation sleeve with built in thermal barrier. This sleeve terminates with a motorised volume control damper which allows the unit to fully open, close or modulate as demand requires.The damper is mounted on the sleeve outlet and can be linked in to the natural ventilation building management system.